Whether students are taking on graduate school or completing specialized training, it seems that multiple higher education credits are becoming common. 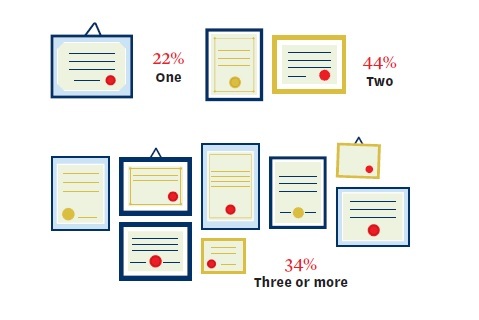 More than three-quarters of the students in our survey plan to get more than one university degree. In addition, 33 per cent of the students surveyed said they intended to pursue a college diploma or other kind of special training after their university degree (or degrees). The students surveyed see further education as a way to increase their competitive advantage when entering the workforce and as a method for keeping their career options open. Ahmad Al Nasser, a second-year student in environmental management and sustainable development, feels his master’s degree will prepare him to deal with such issues as water security and food and wealth inequality in both developing and developed countries.